In 1847, a pioneer from Missouri named Augustus journeyed to the Oregon territory. He traveled the Tualatin Plains Indian Trail searching for land for a homestead. He eventually chose a spot not far from Garden Home with fertile lowlands and a stream running through it. He filed the first land claim in what is now Washington County. Augustus became a successful farmer, eventually specializing in onions. At the 1905 Lewis and Clark Exposition, Augustus was proclaimed the “Onion King”. The creek that traversed the original homestead now bears Augustus’s family name: Fanno Creek. A portion of Fanno Creek flows through Garden Home. By the early 1900’s, the Garden Home area had grown into a successful farming community and the large stands of trees supported a couple of lumber mills. Electricity had arrived and with it, the electric railroad. In 1906, the Oregon Electric Railway Company established a route from downtown Portland through Garden Home. 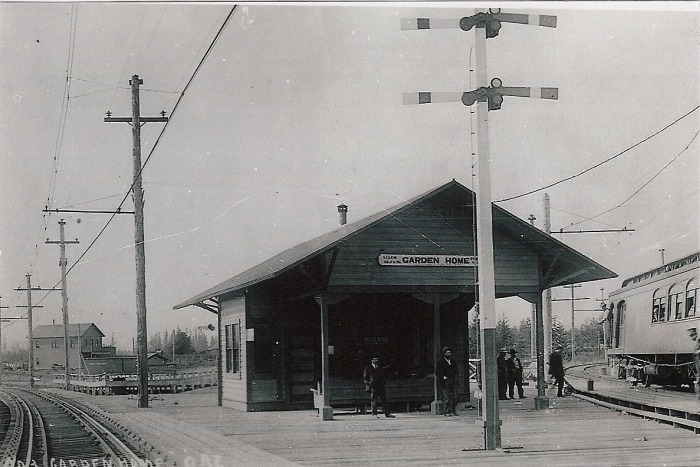 The Garden Home railroad station was located near where the Old Market Pub is today. Because few Garden Home residents owned automobiles, the railway quickly became a popular mode of transportation and provided a commuter rail for residents with jobs in Portland. The community constructed a wooden sidewalk on the south side of Garden Home Road so pedestrians could avoid the muddy road. The train was one of the main reasons that Aaron Frank built his summer residence in Garden Home. He raised show horses and with the railroad adjacent to his property, he could transport the horses to shows all over the country. In its heyday, the Oregon Electric ran 55 trains a day through Garden Home. Passenger service on the railroad ceased in 1933 and soon the tracks were abandoned. There used to be two riding academies in Garden Home, the Nicol Academy where Oregon Episcopal School is today and next to the Frank Estate was the Portland Hunt Club. Riders found the abandoned right-of-way to be a great trail for horseback rides. The right-of-way eventually became known as the Bridle Path. The Bridle Path also became a popular pedestrian route. In the late 1960’s, a freeway from southeast Portland through Garden Home to Beaverton was proposed. Some members of a group known as the Garden Home Improvement League opposed the notion of the right-of-way becoming a freeway. They began promoting the idea that the right-of-way/bridle path should become a permanent trail. Rumor has it that they were able to enlist the support of Aaron Frank’s son Gerry and he enlisted the support of his friend, Senator Mark Hatfield. For whatever reasons, political or otherwise, the notion of the freeway was dropped. In the mid 1970’s, Washington County, like all other jurisdictions, was subject to a new Oregon law that required land use planning. Community activists saw an opportunity for their vision of a trail to become a reality and lobbied successfully for its inclusion in the Raleigh Hills-Garden Home Community Plan. When the plan was adopted as a zoning ordinance, the right-of-way was identified as land that “shall be developed as a community pedestrian/bicycle path in order to provide a unique transportation/open space/wildlife habitat corridor”. But building and completing the trail would take another 25 years. Portions of the trail between SW 86th and SW 92nd were publicly owned. The portion nearest SW 92nd was owned by Washington County but sometime in the 1980’s, the property was nearly sold when it was deemed excess property by the County. The community rallied and after much public discourse, the sale was dropped and the property turned over to the Tualatin Hills Park and Recreation District (THPRD). The District was then able to develop an unpaved (later paved) path from SW 86th to SW 92nd. In 1989, there was a proposal to redevelop the Frank Estate. A condition of approval of the development was dedication of a trail right-of-way to THPRD. In the early 1990s, THPRD developed a paved trail from the Garden Home Recreation Center to approximately SW 78th. In 1992, Metro adopted the “Metropolitan Greenspaces Master Plan” and the Fanno Creek Regional Greenway Trail which includes the Garden Home portion, was one of the adopted regional trails. Meandering through several cities and two counties, the trail is intended to eventually connect from the Willamette River to the Tualatin River. The remaining middle section of the Garden Home portion of the trail remained in private ownership and undeveloped until the late 1990’s when the City of Portland proposed a sewer pump station near Fanno Creek and SW 86th. As part of the construction of the pump station, the City agreed to obtain the necessary right-of-way and construct a trail connecting the eastern and western portions. The trail was then turned over to THPRD. L to Rt: David Endres (THPRD community affairs director); Terry Moore (THPRD Board 1995-2003); Mark Knudson (THPRD Board) Bob Cynkar (Portland BES public involvement liaison to first pump station project); Bob Bothman (THPRD Trails Advisory Committee Chair); Carl Hosticka (Metro Councilor District 3); Nathalie Darcy (Fanno Creek Trail Committee). This entry was posted in Early History and tagged Fanno, Fanno Creek Trail, Moore, Trains. Bookmark the permalink.